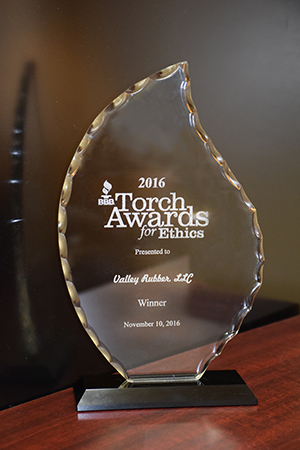 Huntsville, AL- November 10th, 2016- Valley Rubber has been selected as the 2016 winner of the North Alabama Better Business Bureau Torch Award for Ethics in the large business category. Over 275 companies and non-profit organizations were nominated and represent a thirteen-county service area. The 19th Annual Torch Awards for Ethics honor North Alabama companies and non-profit organizations that demonstrate the highest standards of business practices to create trust. These companies and non-profits generate a high level of trust among their employees, customers and their communities. The award was established in 1998 and embodies the BBB’s mission of advancing marketplace trust. Valley Rubber’s vision is to be the Trusted Source for tough mining and industrial rubber solutions, and core values include: serving customers, manufacturing excellence, anticipating needs, investing in relationships, inspiring trust and glorifying God. The complete list of winners in other categories can be found here.